Halq (Arabic: الحلق) refers to the act of shaving the entire head and Taqsir (Arabic: التقصير) involves trimming the hair on the head by at least an inch. Performing Halq or Taqsir is the Wajib (obligatory) act that must be performed in order to leave the state of Ihram. Certainly Allah had shown to His Messenger the vision with truth: you shall most certainly enter the Sacred Mosque, if Allah pleases, in security, (some) having their heads shaved and (others) having their hair cut, you shall not fear, but He knows what you do not know, so He brought about a near victory before that. In a dream, the Messenger of Allah ﷺ saw himself entering Makkah and performing Tawaf around the House. He told his companions about this dream when he was still in Madinah…some of them indeed had their head hair shaved, while some of them had their head hair shortened. Halq (shaving) or Taqsir (trimming the hair) is Wajib (obligatory) if you have hair on your head. You won’t be able to leave the state of Ihram until you have performed one of the two. Allah’s Messenger ﷺ came to Mina; he went to the Jamarat and threw pebbles at it, after which he went to his lodging in Mina, and sacrificed the animal. He then called for a barber and, turning his right side to him, let him shave him; after which he turned his left side. He then gave (this hair) to the people. If you have no hair on your head, simply passing a razor over your head will suffice. When doing Taqsir, the minimum amount to trim is the length of a fingertip from all ends of the hair (about an inch). To simply trim a fingertip’s amount is insufficient. The hair should be trimmed until it is certain that the minimum amount has been trimmed. It is permissible and a common practice to have someone else cut your hair for you. It is not necessary for that person to have had their own hair cut before cutting yours. Men and women may also cut their own hair to come out of Ihram. For those performing Hajj, although Ihram restrictions will be lifted after cutting the hair, marital relations will only become lawful after performing Tawaf al-Ziyarah. The Messenger of Allah ﷺ forbade women to shave their heads. A woman is simply to trim a fingertip’s length i.e. about an inch from the end of her hair. In the case of a woman’s hair being very short in length, it must still be trimmed in order to leave the state of Ihram. If you’re performing Umrah or Hajj al-Tamattu, don’t forget to cut your hair prior to coming back to the hotel. Many women forget to do so and incur penalties due to still being in the state of Ihram. Women in a state of menstruation must also cut their hair. For those performing Umrah out of the Hajj season, the hair is cut once after performing Sa’i. For those performing Hajj al-Tamattu, where Umrah and Hajj are performed separately, the hair is cut twice; once during Umrah and once during Hajj, after the Hady is completed. For those performing Hajj al-Qiran, the hair is cut once during Hajj, after the Hady is completed. For those performing Hajj al-Ifrad, the hair is cut once during Hajj and can be performed straight after the pelting of Jamarat al-Aqaba (the big pillar). 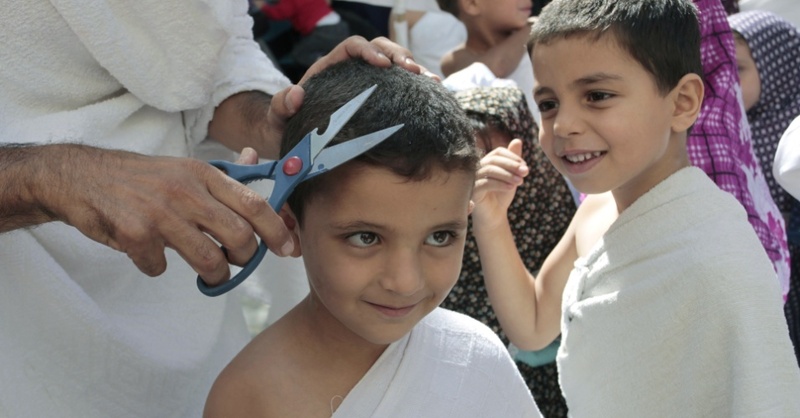 For all three types of Hajj, the hair must be cut before sunset on the 12th of Dhul Hijjah. If it is delayed beyond this point, a penalty will be due. The hair can be cut in Makkah, Mina or Muzdalifah. It is Sunnah for those performing Hajj to have the hair cut in Mina. Getting a haircut inside Makkah or Mina can be very cheap or very expensive. There are two types of barbers; those who are licensed and those who are not. Unlicensed barbers, who operate by the roadside, usually charge between 5 and 10 Riyals. Although cheap, many advise against using unlicensed barbers due to the health risks associated with their practices. They often use non-sterile blades on more than one person, which can spread diseases and infections such as hepatitis and HIV. Some of these unlicensed barbers also exercise a lack of care, which can result in cuts and bleeding during shaving. Licensed barbers, on the other hand, charge up to 30 Riyals for a shave. Although slightly more expensive, they use single-use disposable blades and are tested for infectious diseases. They also tend to exercise more care during shaving. It’s certainly worth paying that little bit more to avoid the aforementioned risks associated with unlicensed barbers. There are a number of licensed barber shops in Makkah, which are open 24 hours a day and generally only close during Salah times. There are many barber shops in the Zamzam Towers, Hilton shopping complex and al-Safwa Towers. 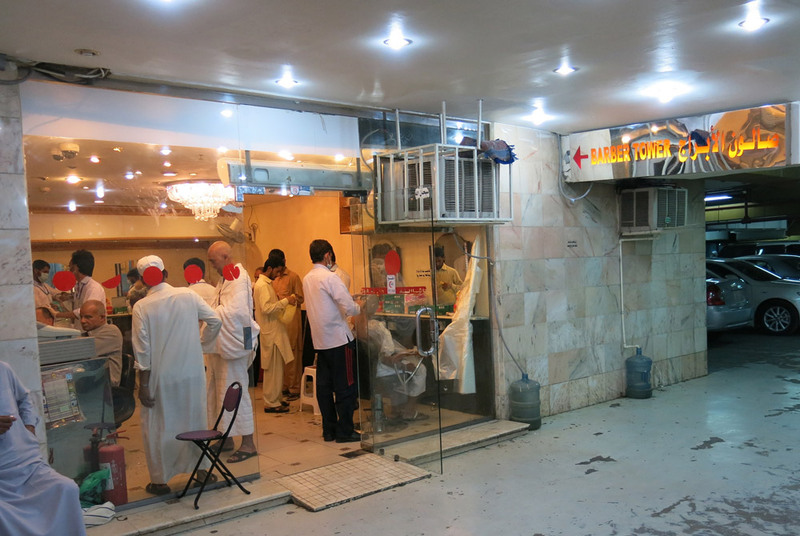 You will also see many barbers located outside the Marwah door after you finish your Sa’i between Safa and Marwah. They are located directly to your left on the ground floor, or to your right if you exit from the middle floor. If you want to get a haircut rather than a shave, you’re looking to pay up to 50 Riyals and above. Please bear in mind that prices also rise during peak season. Since barber shops are often busy and to save some money, you also have the option of shaving your own head. You can bring hair clippers to cut your hair and use a razor to clean shave your head. Alternatively, you can go to the barber shop and have the barber use equipment that you have bought along with you, nullifying any potential health or hygiene problems you may be wary about. Go to a licensed barber, rather than an unlicensed street barber. Make sure single-use disposable blades are used. Ask the barber to thoroughly wash his hands with water and soap before shaving. Use your own equipment to shave your head or ask the barber to do it for you. Never share your grooming equipment with others to use.